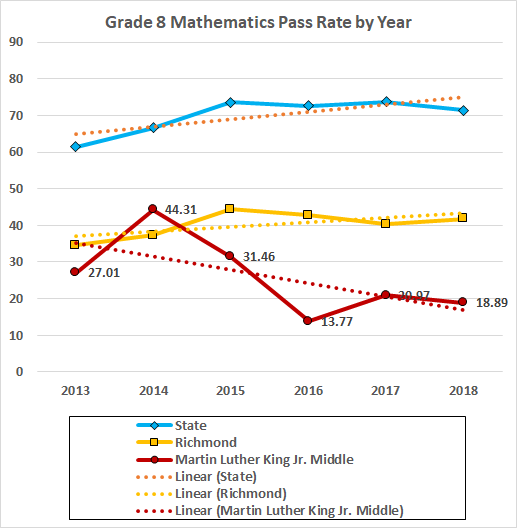 In terms of the five-subject average SOL pass rate, Richmond’s Martin Luther King Jr. Middle School is the second worst school in Virginia. 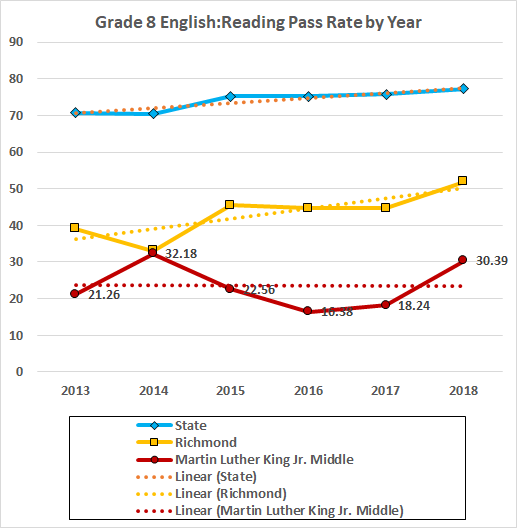 In terms of the school average, the reading pass rate this year increased 6.76 points to 31.6% (that is, 68.4% of the students flunked the test); the math average rose 0.51 to 21.9% (a 78.1% failure rate). 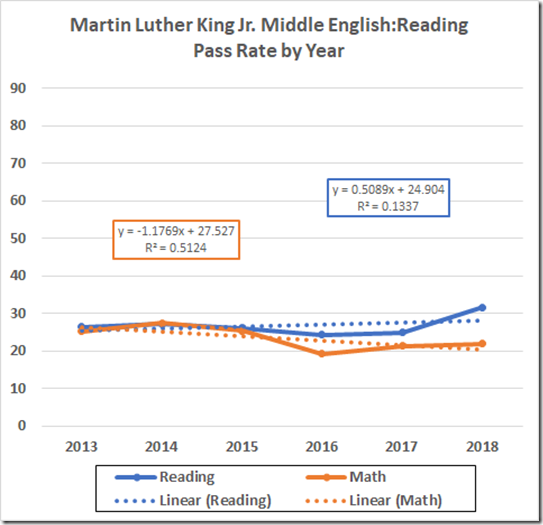 If we use the least squares fitted lines to extrapolate, the reading pass rate reaches the (former) 75% accreditation benchmark in 92 years (2110). 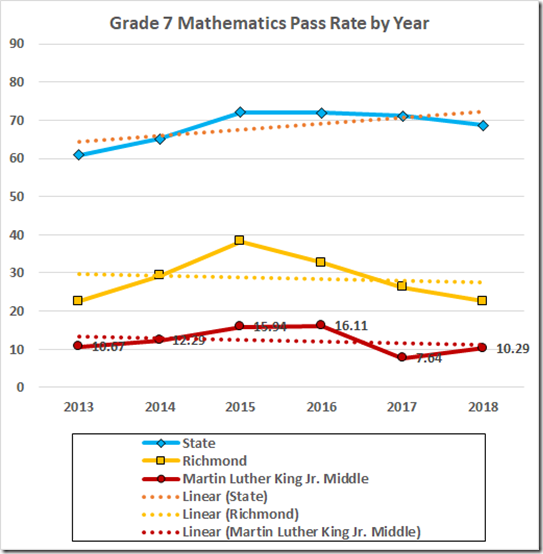 The fitted line to the math rate data has a negative slope; it never reaches the math benchmark, 70%. 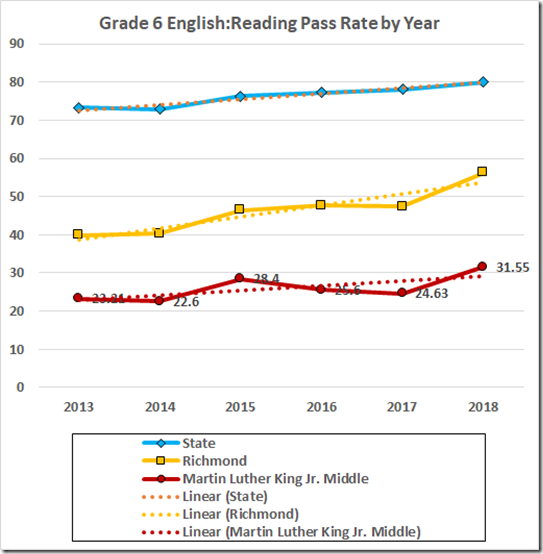 The sixth grade reading rate improved from 24.6 to 31.6. 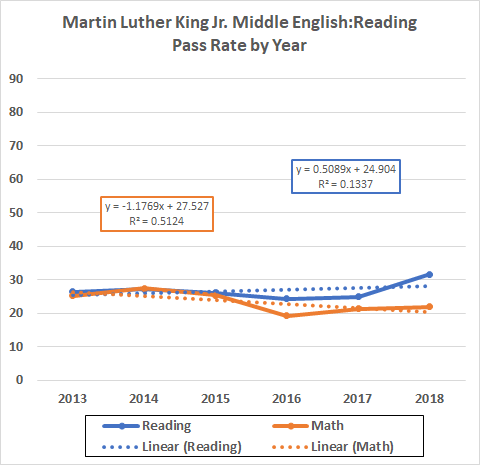 The extrapolation reaches the benchmark in 36 years. 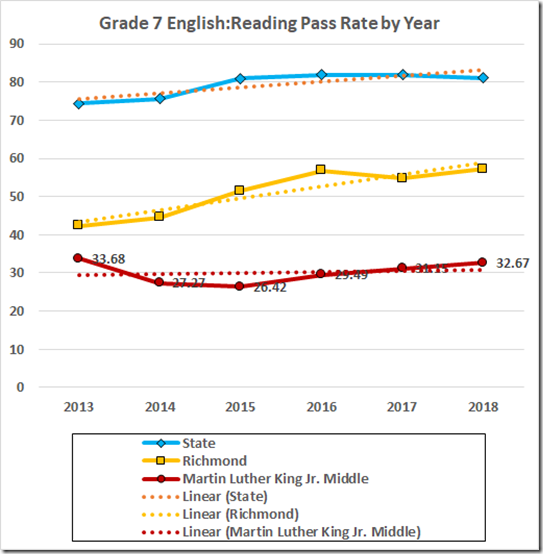 The seventh grade reading pass rate rose to 32.7; the data extrapolate to reach 75 in 159 years (161 years if you don’t round up). 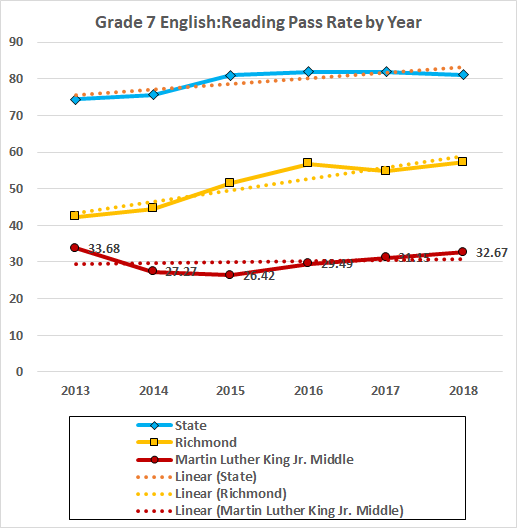 The fitted line for the eighth grade data has a negative slope; it never reaches the benchmark. 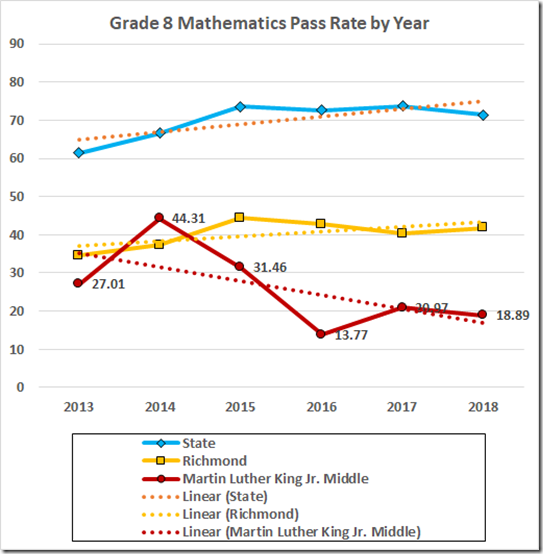 The 12.2 point increase this year still left a 69.9% failure rate. 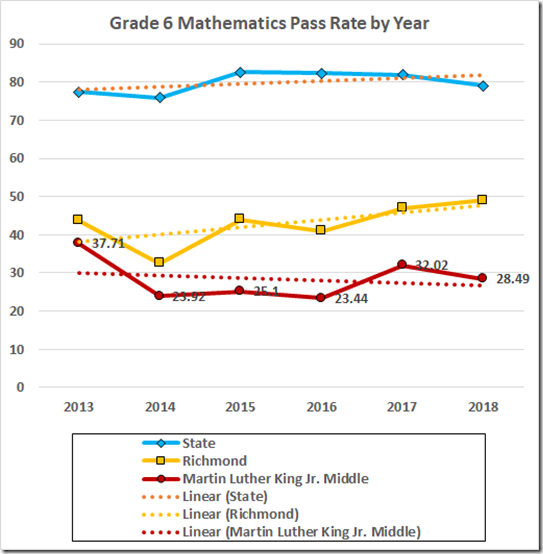 On the sixth grade math tests, the scores dropped below 30% this year. The line fitted to the data has a negative slope. 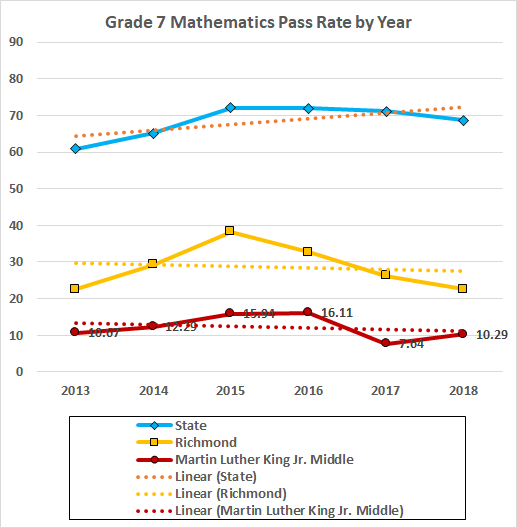 The seventh grade math pass rate increased by 2.65 points this year, but left an 89.7% failure rate. 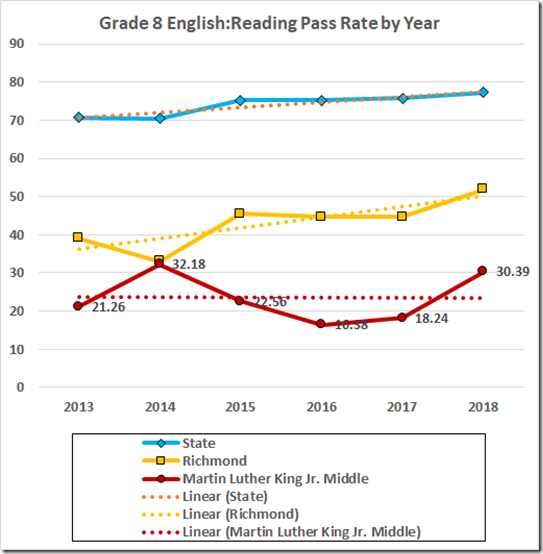 The fitted line, yet again, has a negative slope. 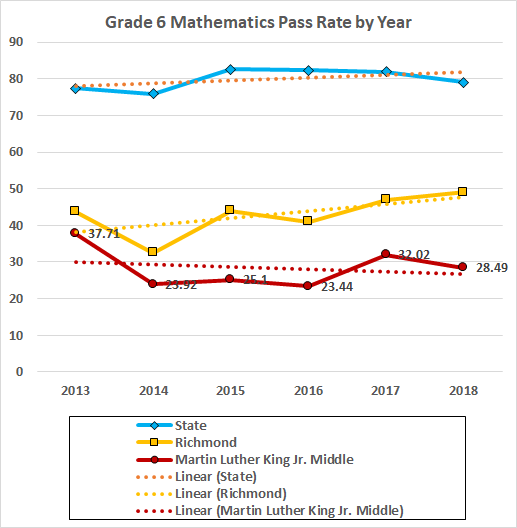 The eighth grade math score, at 18.9 this year, is lower than last year’s 21.0, and the fitted line again has a negative (this time a large negative) slope. This is a picture of profound failure. 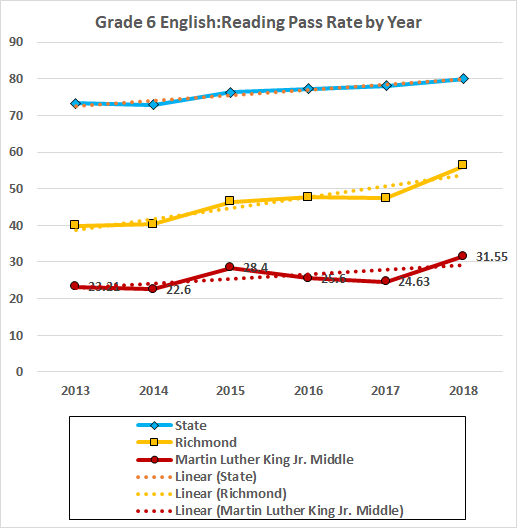 It may well be that these scores are being depressed by cheating in the elementary schools (by the schools, not the kids) but that merely moves the location of (part of) the problem: RPS is failing, miserably, and is damaging children it is supposed to be educating. What Happened at Fairfield Court?